Description: Experienced food allergy nutrition consultants helping to take the guesswork out of eating. Let us help you find foods that are safe, affordable, and enjoyable to eat. Common food allergies we consult are wheat, milk, corn, soy, egg, peanuts, and tree nuts. Call today for a free 20 minute consultation. The skies are friendlier if you call ahead. Are you leavin’ on a jet plane? If you have food allergies, do your homework before you book your flight. 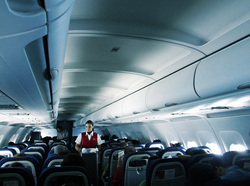 While no airline can guarantee the complete absence of peanuts or other allergens from a flight, the allergy policy of airlines varies widely between companies. Choose an airline that will accommodate your needs. Allergy Policy: Has guidelines for travelers with special needs. Special Meals: AirTran is a discount carrier and does not serve full meals on their flights. They do offer beverage service. Allergy Policy: American Airlines does not serve peanuts in-flight, but does serve other nuts, which may contain traces of peanut. They can not guarantee that a flight will be peanut-free. Special Meals: American Airlines offers gluten-free and vegan (dairy-free) meals, which must be booked in advance. Allergy Policy:Continental does not serve peanuts in-flight, but can not guarantee that food served will be free of all traces of peanuts. Special Meals: Contintental Airlines offers gluten-free and vegan (dairy-free) meals. They must be ordered at least 24 hours before departure. Allergy Policy: Delta will create a "buffer zone" of three rows in front of and behind customers with severe peanut allergies. People seated within this zone will be served non-peanut snacks – the rest of the plane may receive peanuts. Delta will allow you to pre-board and sanitize your seat. Special Meals: Delta lists the name-brand snacks served on short flights on its web site. Gluten-free meals are available for longer flights. You must contact reservations at least 12 hours before departure for special meals. Allergy Policy:JetBlue does not serve peanuts on board, but does serve other nuts, which may be cross-contaminated with peanuts On request, JetBlue will create a buffer zone around you and ask that passengers in that zone do not eat any nuts. Special Meals: Jet Blue lists in-flight snacks on its web site, and offers a limited selection of boxed meals, none of which are allergen-free. Allergy Policy: Southwest normally serves peanuts in-flight, but can substitute other snacks upon request. The airline suggests that customers with peanut allergies book their flights by phone and notify the airline of their allergy. Southwest also suggests booking early-morning flights, when the plane is at its cleanest. Special Meals: Southwest does not serve full meals, but does serve in-flight snacks. Allergy Policy: Can not accommodate peanut-free snack requests. Special Meals: Gluten-free and vegan (dairy-free) meals are available. Special meals must be ordered at least 24 hours in advance. Allergy Policy: United does not serve peanuts or foods cooked in peanut oil in-flight. However, they do serve prepackaged foods that may be cross-contaminated with peanuts. Ephenphrine auto-injectors and liquid antihistamines are exempt from the TSA 3-ounce limit on liquids. If you can find a small bottle of antihistamine that fits into a one-quart zip-top bag, then you do not need to declare it to security personnel. Since most auto-injectors do not fit into a plastic zip-top bag, your should remove your auto-injector from its bag and send it through the x-ray machine separately. I have found that when I do this, the TSA personnel usually thank me, since it saves them the time of trying to figure out what they are looking at on the x-ray screen. You will need to have the printed label or doctor’s prescription to go with your auto-injector and any other prescription drugs you may have along.